I started off by modpodging my PP on the box and used my sanding block to sand off the excess paper. 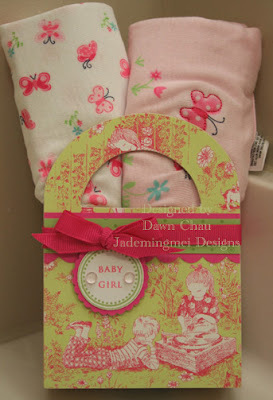 I then added the scalloped edge border. I used a small strip of SU! 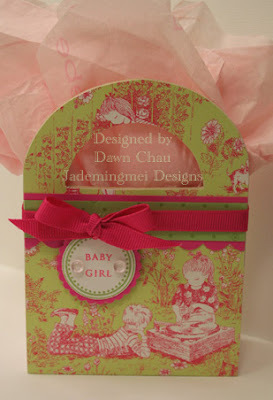 Old Olive cs and stamped it with a the small polka dot bg stamp. Mike's ribbon is added on both layers. 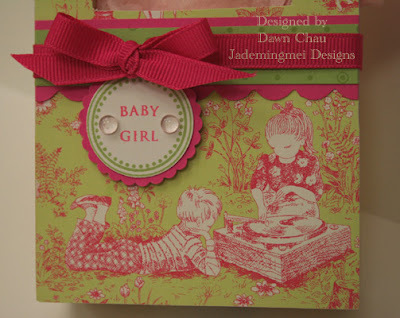 The "baby girl" sentiment and dotted circle stamp are both from Papertrey Ink. There was still a little gap after I stamped on the sentiment so I glued on some Dew Drops(Spring Blossom) for a little added glimmer. Your work is so lovely. Everything you make shines!